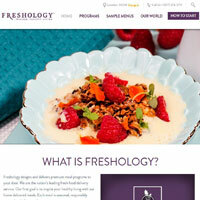 Freshology delivers delicious looking and sounding diet foods, right to your door. You simply pick the plan you’d like to follow, and then wait for your deliveries. This is a simple but tasty way to lose weight, with all the hassle of cooking removed. This service is probably best suited to professionals who have little time to cook diet foods, but who have the money to spend on deliveries. If you take a look at the prices section of this review, you’ll see that Freshology is pretty expensive. At around $50 per day (once you include delivery charges too), this isn’t going to be affordable for everyone. However, if you can afford to pay for this service, the food does look great. Many of the dishes seemed to be of restaurant standard, with fresh ingredients (as the name suggests). Frankly, we’d be happy to eat these delicious dishes whether or not we were on a diet! As for online tools, there really aren’t many. Essentially this site is a portal for you to order meals and find out what’s involved in the various diet plans. Exercise is encouraged but there’s not really any information about exercises to help you lose weight, so you’ll have to look elsewhere for that information. Plans are very varied, and take your personal situation in to account. For example, you can choose a program which focuses on the speed of your weight loss, your fitness or the style of food you prefer. You can also choose diets which are gluten free, vegetarian, for new mums or offer low cholesterol. If you’re not sure which one to go for, you can contact the customer services team at Freshology.com. If you love your food and don’t mind paying extra for something tasty and healthy, this site could be the one for you. However, if you want to be able to track and monitor your progress online, or wish to get a little support from a community of slimmers, this probably isn’t going to be the place for you. Also, you need to be prepared to foot a large bill, as these programs are expensive options. Still, if you have the cash and wish to eat well whilst losing weight, Freshology seems like a good place to try.